Wondering what Construction Management is? Why Study Construction Management at JBU? JBU’s Balzer Technology Center has the space and equipment you need to become a true expert, and our faculty have years of wisdom to pass on to you. You'll do more than swing a hammer. You'll learn to become the problem-solving leader employers want. You'll integrate engineering and design concepts, project management and business skills, and the latest computer applications and communication skills. Want a secure career? Your CM job can't be outsourced, and the average starting salary for JBU CM grads is around the same as a starting engineer. As part of your capstone course, you'll oversee a project from start to finish by planning, estimating, procuring materials, executing projects, supervising underclassmen students, and coordinating subcontractors for the job. You'll be heavily recruited for internships during and after college by numerous industry leading companies like Turner, Vaughn, Kiewit, Nabholz, Crossland, Manhattan, and Rausch Coleman, each of whom appreciates the value of the JBU Construction Management graduate. You'll design and build viable disaster shelters for the Samaritan’s Purse Disaster Shelter Competition, develop a major project proposal at the TEXO/ASC Student Competition, and tackle tough ethical issues at the AIC Ethics Competition. You'll have the opportunity to spend a summer working service or missions organizations like Samaritan's Purse responding to disasters, managing community projects in underdeveloped countries, or building in economically depressed areas of the U.S. The full-time and adjunct faculty at JBU CM have extensive experience in the construction field and provide students with a clear perspective on the professional or service world they are preparing for. All Construction management majors are required to take the Associate Constructor Certification (Level 1) exam during their last semester at JBU. Details on this certification and exam may be found at http://www.professionalconstructor.org/page/AC_Certification . The Certified Professional Constructor Certification (Level 2) exam can be taken after graduating from an ACCE accredited school, successful passing of the level 1 exam, and completing four years of professional practice in managing construction. This CPC certification is an excellent proof of commitment to the ethics and professionalism in the field of construction. The JBU program develops future construction professionals with the maturity, integrity, and self-confidence to be successful construction professionals. They also bring practical skills, are effective communicators and problem solvers, work well in a team-oriented environment, and bring a strong desire to add value. 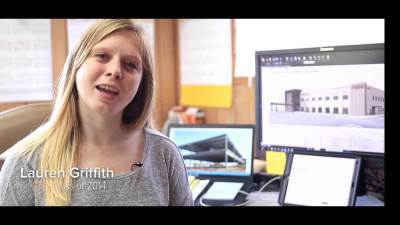 Meet Lauren Griffith ’14, a project engineer with Manhattan Construction. 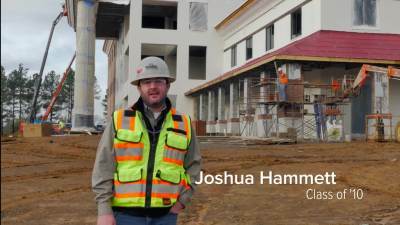 Meet Joshua Hammett, '10, an assistant project manager with Nabholz Construction. 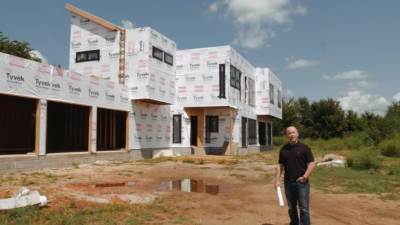 Jacob Tankersley ’02, owner of GB Group Construction, a custom home builder in Northwest Arkansas. Jim Caldwell is head of the department of construction management. He earned his Master of Science degree in Construction Management from Purdue University in 1984 and his bachelor's degree in Building Construction from JBU in 1980. Mr. Caldwell is a Certified Professional Constructor, a Professional Land Surveyor, and a member of the American Association of Cost Engineers. Prior to teaching at JBU, Mr. Caldwell worked on large industrial construction projects in the areas of construction surveying, cost control, and supervision. He is now involved with commercial estimating and land surveying during the summer months. Mr. Caldwell and his family have been on construction service projects in central Africa, Haiti, Guatemala and Mexico. He and his wife Barbara have four children. Mr. Caldwell has over 35 years of industry experience, specializing in cost estimating and surveying and sharing his knowledge in 10+ countries. Mr. Rick Faust earned a Bachelor of Science degree in Education from Minnesota State University at Moorhead in 1979. In 1986, he finished an Associate's Degree in Building Construction from JBU and spent the next several years designing and building homes and other wood-frame structures in Northwest Arkansas and at various locations in the U.S. and Mexico where he led church teams on short-term mission projects. In 1991, Mr. Faust settled in Siloam Springs and started his own residential design company Upright Design, Inc. which specializes in designing local custom homes and custom stock home plans for publication on the internet and through local magazine outlets such as Lowe's. Mr. Faust is a professional member of the American Institute of Building Design. Along with his design experience, he has a great deal of first-hand knowledge in construction methods and materials from all the structures he has both designed and built himself. He and his wife Connie have three children. Mr. Mark Terrill earned his Master of Science degree in Engineering (Construction Management) from the University of Texas at Austin in 1998, and his bachelor's degree in Geological Engineering from New Mexico Institute of Mining and Technology in 1985. Mr. Terrill is a Professional Engineer (Civil) in the state of Virginia. Prior to teaching at JBU, he spent 22 years in the U.S. Navy Civil Engineer Corps retiring in 2008 at the rank of Commander. His experience includes construction management, construction contracting, contingency construction, and facilities management in various locations including Virginia, Arizona, Guam, Spain, the Philippines, and Iraq. He and his wife Dine have four children. Provide technical engineering information to company supervision and crafts to ensure construction work complies with all engineering standards. Assist in gathering, calculating, and compiling cost data for use in bid proposal estimates for one or more discipline areas. Assist in supervising craft employees assigned to a particular construction discipline work area such as concrete, reinforcing bar, excavation, erection of structural steel, duct work, or electrical piping. Perform tasks related to the collection of cost data required to monitor project budgets and estimates. Learn to apply the principles and techniques of resource monitoring to specific tasks related to a portion of a project through on-the-job training. Purchase expendable construction materials and supplies, repair parts for company equipment, small tools, and administers service contracts. Perform tasks related to the collection and evaluation of data required to monitor project schedules. Learn to apply the principles and techniques of resource monitoring to specific tasks. Perform or assist in a variety of quality control engineering and inspection work related to a specific discipline such as civil, structural, mechanical, piping, welding, NDE, and/or electrical. Provide administrative and technical research support to corporate and/or project relations personnel. Coordinate, administer, and supervise routine on-site contract (or sub-contract) work, using standardized methods relating to the processing and recording of contracts for one particular project. Clark has spent the better part of the past two years juggling a full-time job as a project engineer for R&H Construction with classes at Multnomah University, where he’s been pursuing a master’s degree in international development and social justice.